If you love sports like the FCA does, then this event is the place for you! 100’s of GREAT SPORTS ITEMS. Both silent & live auction items. 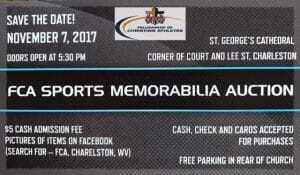 The Fellowship of Christian Athletes of West Virginia is proud to once be hosting their annual Sports Memorabilia Auction at St. George’s Cathedral Church in downtown Charleston, WV. Delicious food & wonderful fellowship. And best part is raising money for FCA-WV. Please call 304-344-9005. Only $5 for admission. Please try to attend and bring a friend. And please share this with your sports friends. Click here to ‘Like’ their Facebook event page. Jim Strawn is serving as our auctioneer.